SAM2 is an email client which uses POP3 and SMTP mail servers to retrieve and send email. It has many features, such as Spam Filters Multiple mailboxes, and Attached files. SAM2 requires Marinetti to be installed. (Note SAM2 will not connect to IMAP or SSL servers). 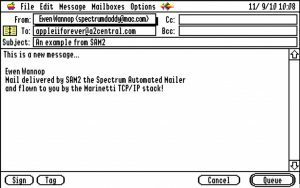 SAM2 supports multiple email accounts, multiple Mailboxes, an Address Book, Filters, and an HTML display where appropriate. To use SAM2, you will need a IIGS running System 6.0.1, Marinetti 3.0.b3 or later, and a connection to the Internet. SAM2 works best with an Ethernet connection, such as the Uthernet card, though it can be used with any TCP/IP Link Layer that Marinetti supports. Your IIGS should have a minimum of 1Mb of RAM, though you will find 4-5Mb is best. 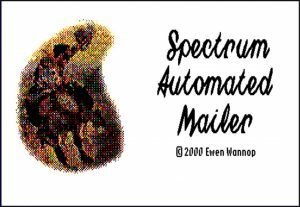 Your IIGS should preferably be accelerated, the faster the better, and should have a hard disk, or memory card, with sufficient free space to handle the amount of email you think you might receive! You will also need at least one email account that supports POP3 and SMTP servers. This may include basic email accounts that come with your ISP.